Set phasers to fun: the team at Oculus VR has announced that the first exclusive launch title for Oculus Rift will be space simulator Eve: Valkyrie. Created by CCP games, Eve has been one of the most popular showcases for the Oculus Rift headset during its journey to market. It's fitting, then, that this is the first Oculus co-publishing project. It'll join the headset's launch lineup and we're looking forward to seeing who else will be on the list too. There still isn't a commercial release date for the Rift but a late 2014 launch is looking likely. However, it might want to get its skates on if it wants to beat Sony, which is believed to have a headset of its own almost ready for market. 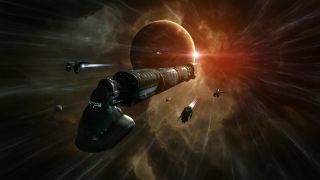 "We strongly believe the best VR experiences are going to be the ones built from the group up for VR, and we've kept that in mind whilst developing Valkyrie," said CCP. Oculus Rift + space = awesome. Trust us, we've been there.